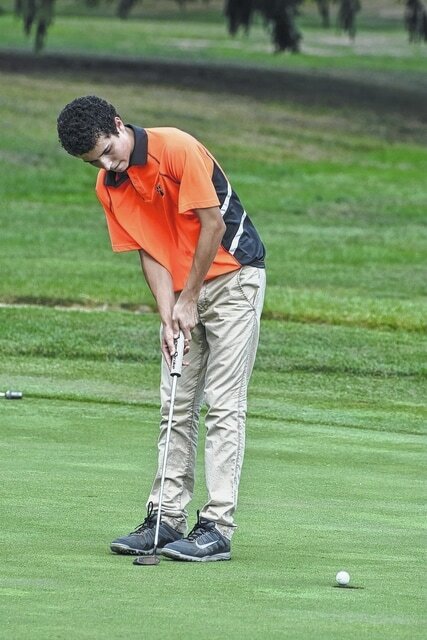 HURON — Galion’s Jack McElligott qualified for district golf competition after firing an 82 during the sectional golf tournament at Sawmill Creed on Monday. He’ll return to action Thursday at Red Hawk Run in Findlay for the district tournament. The Galion boys golf team shot an overall team score of 372, which was not enough to move on to districts as a team. The Ontario Warriors won the sectionals event with a team score of 327 and the Clear Fork Colts finished third at 347. Both teams will play in districts play. “I was very pleased with how Jack played (today). He held himself together and battled mentally though some missed putts. I am proud of his performance, especially with him being a sophomore. I am looking forward to seeing how he plays at districts,” said coach Bryce Lehman. Matt Kingseed finished the day with a score of 91. Mitch Dyer also had a sub-hundred score finishing with a 99. Brevin Owens added a 100 and Kaleb Harsh penciled in a 103. The Galion Tigers finished this season in the middle of the pack in the Mid-Ohio Athletic Conference Red division with a league record of 6-6. The future is bright for Lehman’s team, as Brevin Owens is the only senior on the varsity team. GALION — After a rain-drenched week last week, the Galion Tigers tennis team was back at it on Monday against the Crestline Bulldogs. The Tigers didn’t miss a beat, defeating the visiting Bulldogs 5-0 to improve to 13-4 on the season. The clean sweep of Crestline in singles competition was relatively quick. At first singles, Kayley Gimbel improved to 16-2 this year, beating her opponent; 6-1, 6-0. Katherine Talbott is now 15-4 after her 6-1, 6-0 victory at second singles. Third singles competitor Jalyn Oswald’s hot streak continued, winning 6-0, 6-0 and moving her record to 18-3. Kiersten Gifford and Katie Baughn had no trouble gaining a point for the Tigers at first doubles, winning 6-3, 6-1. The second doubles team of Marissa Breinich and Orchid Parsons gained Galion’s fifth point after a 6-2, 6-1 victory against their Crestline opponent. Against New Riegel Marisa Gwinner was 14/16 hitting and had eight kills and Gabby Abouhassan went 9/12 hitting with four kills. Morgan Gregory went 46/48 handling with 13 assists. Gregory was also one of the top servers for Galion, alongside Callie Wildenthaler. Wildenthaler was a perfect 9/9 from the service line with five points and an ace. Gregory added 8/10 serving with five points and the other three aces that the Tigers recorded for the match. Against the Buckettes, the Tigers were only serve t20 times. Galion was 16/20 as a team and notched just eight service points. Morgan Gregory had the only two aces for the Tigers, going 2/2 serving with two points. Chloe McCleese also did her part to help, going 5/7 serving with five points. Galion’s defense had two blocks and 31 digs in the losing effort. They were also 31/37 in serve reception. Galion volleyballer Nicole Thomas stretches to keep the ball alive against New Riegel in a match on Saturday at Buckeye Central. http://aimmedianetwork.com/wp-content/uploads/sites/38/2016/10/web1_Galion-Volleyball_01.jpgGalion volleyballer Nicole Thomas stretches to keep the ball alive against New Riegel in a match on Saturday at Buckeye Central. Jack McElligott watches a short putt slide by the left side of the hole Thursday on the par five 12th hole at Sycamore Creek Golf Club. The Tigers were hosting River Valley and Jonathan Alder. Photo by Don Tudor. http://aimmedianetwork.com/wp-content/uploads/sites/38/2016/10/web1_Jack-McElligott.jpgJack McElligott watches a short putt slide by the left side of the hole Thursday on the par five 12th hole at Sycamore Creek Golf Club. The Tigers were hosting River Valley and Jonathan Alder. Photo by Don Tudor.